Attenuator trucks or more widely known as TMAs (Truck Mounted Attenuators) are designed to save lives within your work zone. These TMA trucks are built to meet requirements for work zone safety, absorb the impact of a speed crash in order to decrease damage made to the vehicle, and as a result save the lives of your workers. The TMA’s are designed to soak up the energy from the collision during rear-end impacts and to prevent the impacting vehicles from under-riding the truck and reducing expensive damage to equipment as well. 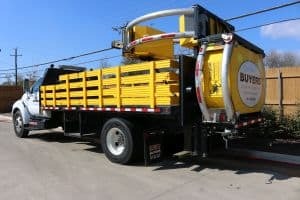 At Buyers Barricades we offer the best quality truck mounted attenuators, they offer outstanding performance, life cycle costs, and quick, simple refurbishment. Truck mounted attenuators can be used as stationary or moving shadow or to support vehicles. The are designed to keep the vehicle in the travel lane, even after an impact. Buyers Barricades takes pride in quality and customer service. With over 10 years of experience serving the work zone safety and construction industry our customers trust us to get the best solution to their construction work needs and value. Click here to contact us for more information or to get a free quote. Trucks are installed with Traffix Scorpion Impact Attenuator.